Making yogurt in an Instant Pot involves a few steps, but the process is easy because the Pot takes care of itself. It will monitor the internal temperature and its own time. I use a pot-in-pot method with a stainless steel bowl. Sterilize the Instant Pot (IP): Pour 1 cup of the water into the pot. Place a stainless steel bowl inside the IP’s inner pot. Secure the lid on the pot and set the pressure-release valve to Sealing. Select STEAM and adjust cooking time to 5 minutes. When cooking time is complete press CANCEL and use the quick-release method to depressurize the pot. Remove the lid and the stainless bowl. Allow the bowl to cool. While the pot is sterilizing, pour the milk into a pan and heat to at least 185°F (85°C). Then cool to 110°F (43°C). The pan can be placed in a sink of cold water to speed cooling. Place the trivet in the IP and add the remaining 7 cups of water (using hot water will reduce heating time). Pour the cooled milk into the stainless steel bowl. Whisk the yogurt into this bowl, mixing it thoroughly. Then place the bowl in the instant pot. It if floats on the water rather than resting on the trivet it will be okay. Secure the lid on the pot. Set the pressure-release valve to Venting (or use the optional glass lid). Select YOGURT and adjust incubation time to 10 to 12 hours, making sure the display says NORMAL. The pot will maintain the inner temperature between 100°F and 110°F (38 to 43°C). When the incubation time is complete, transfer the inner pot to the refrigerator to cool the yogurt, covered and undisturbed, for at least 6 hours or overnight. Place a colander or strainer lined with a double layer of cheesecloth or a large coffee filter in a large bowl. Transfer the yogurt to the lined strainer and cover the bowl and strainer with plastic wrap. Let strain in the refrigerator for about 1 to 2 hours for regular yogurt or at least 8 hours or overnight for Greek-style yogurt. Transfer the strained yogurt to a tightly sealed container and store in the refrigerator. 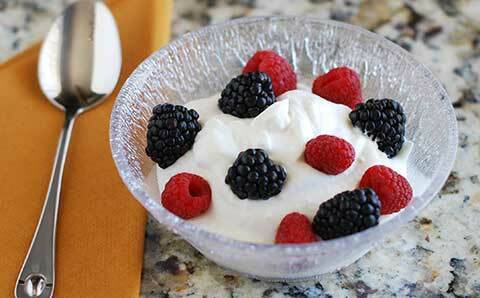 Enjoy yogurt plain or with fruit, preserves, nuts, or granola. Or flavor with vanilla and honey. *NOTE: Milk that is higher in fat will produce thicker, creamier yogurt than 1% or skim milk—but you can also thicken yogurt by straining it for a longer period of time.